17 April 2014 – Results of the first nationwide survey on soil pollution, previously considered a “state secret” was released to the public by the MEP. The survey was conducted between April 2005 and December 2013 by the MEP and MLR. Several experts and officials have warned that the numbers could be on the “conservative” side. The survey also noted that cadmium in soil has risen faster in the southwest & coastal areas of China: up by >50% compared to other areas where it has risien by 40% since the late 1980’s. 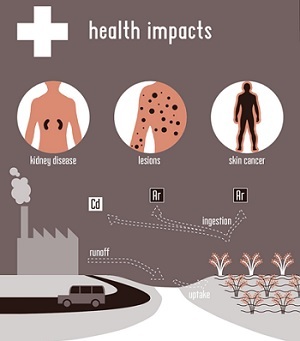 Health implications of these results are outlined in the infographic to the left (click here for the full infographic by china dialogue).